For each noble house in the Seven Kingdoms, the choices that leaders make often lead to tragedy and ruin. In Game of Thrones: Ascent, you play as an up-and-coming noble who, through endless decision-making and item crafting, can move a bit closer to the Iron Throne. However, failure and death aren’t a real option in Ascent; instead, it’s all about waiting and paying. 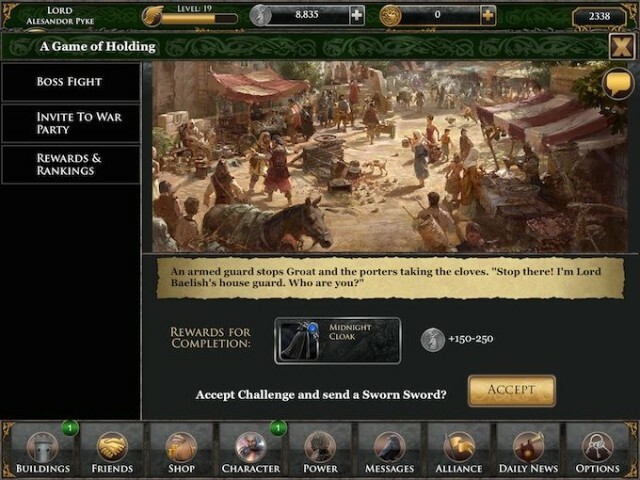 Game of Thrones: Ascent originally launched on Facebook, and it’s a free to play game, so you can expect two things right off the bat. First, this casual game is so basic that you can’t possibly lose — the only consequence for making poor decisions is that you’ll waste some time. Second, there’s a lot of waiting involved, and even the most basic actions can take hours to complete. Ascent constantly asks you to bribe the Keeper of Coin to speed up every action. 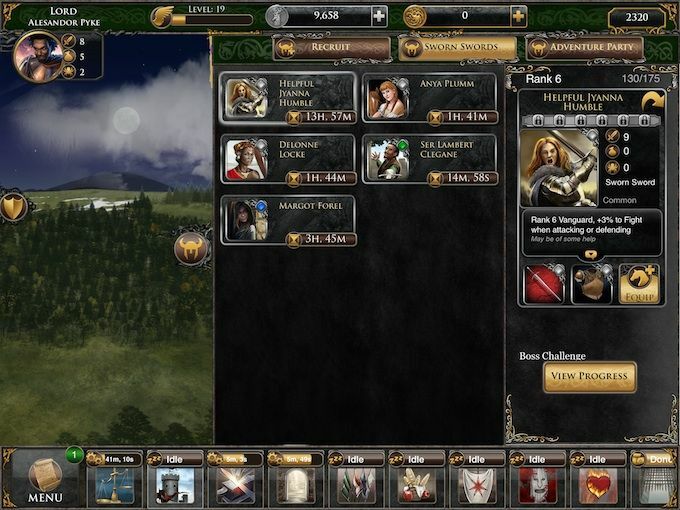 As you play through the game’s book-like narrative structure, you’ll bring together advisers and hired swords to keep the King’s justice, plot against other noble houses, or witness events from the main plot-lines of A Song of Ice and Fire. Usually this boils down to selecting a few dialogue choices and then a tactic that such as bartering or sabotage. Ascent’s writing is ambitious, often giving you a fresh perspective on notable events, but it’s also not nearly as exciting as George R. R. Martin’s original text. You often can’t alter the course of the story, although you can define some of your house’s minor traits. With countdown timers that pop up every time you do something interesting, Ascent becomes a dull waiting game. Waiting for your armies to return from battle is one thing, but there’s even a countdown timer when you pray to a tree in the Godswood. It’s excessive and produces the opposite effect of the books: You’ll be forced to put your device down repeatedly. As a town-building sim, Ascent isn’t much better. Your storehouses can produce a huge variety of goods, but they all require a lot of time to order while barely improving your army’s abilities. To get ahead quickly, you’ll have to pay. For dedicated fans of the book and show, Game of Thrones: Ascent isn’t the worst way to spend your time between new installments. Certain social aspects, like setting up alliances and marriages with your friends, are clever interpretations of the relationships in the series. But while Westeros has big consequences for failure, this game doesn’t. Whole seasons will pass before you’ve unlocked all of the game’s content, and by then, you won’t really feel that much richer or more powerful. The Good: Narrative-based quests that follow the series; attractive artwork; city-building aspects; lots of ways to upgrade your characters; social features include arranged marriages. The Verdict Game of Thrones: Ascent is an ambitious attempt to build a social, narrative-driven game with lots of battles, but most of the game just involves waiting around.